Ideally, palliative care improves a patient’s quality of life while facilitating appropriate usage of healthcare resources. However, initiating palliative care late in a disease course or in the inpatient setting may limit these beneficial effects. This 2010 study by Temel et al. sought to demonstrate benefits of early integrated palliative care on patient-reported quality-of-life (QoL) outcomes and resource utilization. The study enrolled outpatients with metastatic NSCLC diagnosed < 8 weeks ago and ECOG performance status 0-2 and randomized them to either “early palliative care” (met with palliative MD/ARNP within 3 weeks of enrollment and at least monthly afterward) or to standard oncologic care. The primary outcome was the change in Trial Outcome Index (TOI) from baseline to 12 weeks. 151 patients were randomized. Palliative-care patients (n=77) had a mean TOI increase of 2.3 points vs. a 2.3-point decrease in the standard-care group (n=73) (p=0.04). Median survival was 11.6 months in the palliative group vs. 8.9 months in the standard group (p=0.02). (See Figure 3 on page 741 for the Kaplan-Meier curve.) Prevalence of depression at 12 weeks per PHQ-9 was 4% in palliative patients vs. 17% in standard patients (p = 0.04). Aggressive end-of-life care was received in 33% of palliative patients vs. 53% of standard patients (p=0.05). Resuscitation preferences were documented in 53% of palliative patients vs. 28% of standard patients (p=0.05). There was no significant change in FACT-L score or lung cancer subscale score at 12 weeks. Early palliative care in patients with metastatic non-small cell lung cancer improved quality of life and mood, decreased aggressive end-of-life care, and improved survival. This is a landmark study, both for its quantification of the QoL benefits of palliative intervention and for its seemingly counterintuitive finding that early palliative care actually improved survival. In practice, this study and those that followed have further spurred the integration of palliative care into many standard outpatient oncology workflows, including features such as co-located palliative care teams and palliative-focused checklists/algorithms for primary oncology providers. Of note, in the inpatient setting, a recent meta-analysis concluded that early hospital palliative care consultation was associated with a $3200 reduction in direct hospital costs ($4250 in subgroup of patients with cancer). 38,343 patients were randomized to the screening group, and 38,350 were randomized to the usual-care group. Baseline characteristics were similar in both groups. Median follow-up duration was 11.5 years. Patients in the screening group were 85% compliant with PSA testing and 86% compliant with DRE. In the usual-care group, 40% of patients received a PSA test within the first year, and 52% received a PSA test by the sixth year. Cumulative DRE rates in the control group were between 40-50%. By seven years, there was no significant difference in rates of death attributable to prostate cancer. There were 50 deaths in the screening group and only 44 in the usual-care group (rate ratio 1.13, 95% CI 0.75 – 1.70). At ten years, there were 92 and 82 deaths in the respective groups (rate ratio 1.11, 95% CI 0.83–1.50). By seven years, there was a higher rate of prostate cancer detection in the screening group. 2820 patients were diagnosed in the screening group, but only 2322 were diagnosed in the usual-care group (rate ratio 1.22, 95% CI 1.16–1.29). By ten years, there were 3452 and 2974 diagnoses in the respective groups (rate ratio 1.17, 95% CI 1.11–1.22). Treatment-related complications (e.g. infection, incontinence, impotence) were not reported in this study. Yearly PSA screening increased the prostate cancer diagnosis rate but did not impact prostate-cancer mortality when compared to the standard of care. However, there were relatively high rates of PSA testing in the usual-care group (40-50%). The authors cite this finding as a probable major contributor to the lack of mortality difference. Other factors that may have biased to a null result were prior PSA testing and advances in treatments for prostate cancer during the trial. Regarding the former, 44% of men in both groups had already had one or more PSA tests prior to study enrollment. Prior PSA testing likely contributed to selection bias. However, this guideline is under active consideration as of March 2018. See https://screeningforprostatecancer.org/. The draft recommendations encourage men ages 55-69 to have an informed discussion with their physician about potential benefits and harms of PSA-based screening (Grade C Recommendation). The USPSTF continues to recommend against screening in patients over 70 years old. 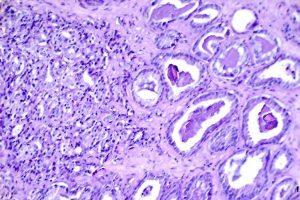 Screening for prostate cancer remains a complex and controversial topic. While we await further guidelines, we should continue to provide our patients with the aforementioned informed discussion. UpToDate has a nice summary of talking points culled from several sources. Malignancy is a pro-thrombotic state, and patients with cancer are at significant and sustained risk of venous thromboembolism (VTE) even when treated with warfarin. Warfarin is a suboptimal drug that requires careful monitoring, and its effective administration is challenging in the setting of cancer-associated difficulties with oral intake, end-organ dysfunction, and drug interactions. The 2003 CLOT trial was designed to evaluate whether treatment with low-molecular-weight heparin (LMWH) was superior to a vitamin K antagonist (VKA) in the prevention of recurrent VTE. The cancer must have been diagnosed or treated within past 6 months, or the patient must have recurrent or metastatic disease. 338 patients were randomized to the LMWH group, and 338 were randomized to the VKA group. Baseline characteristics were similar among the two groups. 90% of patients had solid malignancies, and 67% of patients had metastatic disease. Within the VKA group, INR was estimated to be therapeutic 46% of the time, subtherapeutic 30% of the time, and supratherapeutic 24% of the time. Within the six-month follow-up period, symptomatic VTE occurred in 8.0% of the dalteparin group and 15.8% of the VKA group (HR 0.48, 95% CI 0.30-0.77, p=0.002; NNT = 12.9). The Kaplan-Meier estimate of recurrent VTE at 6 months was 9% in the dalteparin group and 17% in the VKA group. 6% of the dalteparin group developed major bleeding versus 6% of the VKA group (p = 0.27). 14% of the dalteparin group sustained any type of bleeding event versus 19% of the VKA group (p = 0.09). Mortality at 6 months was 39% in the dalteparin group versus 41% in the VKA group (p = 0.53). Treatment of VTE in cancer patients with low-molecular-weight heparin reduced the incidence of recurrent VTE relative to the incidence following treatment with vitamin K antagonists. Notably, this reduction in VTE recurrence was not associated with a change in bleeding risk. However, it also did not correlate with a mortality benefit either. This trial initiated a paradigm shift in the treatment of VTE in cancer. LMWH became the standard of care, although access and adherence to this treatment was thought to be limited by cost and convenience. Until last week, no trial had directly compared a DOAC to LMWH in the prevention of recurrent VTE in malignancy. In an open-label, noninferiority trial, the Hokusai VTE Cancer Investigators demonstrated that the oral Xa inhibitor edoxaban (Savaysa) was noninferior to dalteparin with respect to a composite outcome of recurrent VTE or major bleeding.